A cinder – path winds along by the side of the pool. It is off the beaten track and few pass this way even by day, so at night it is still more quiet. Trees grow thick and bosky all around the pool, with willows and other trees I cannot name by the path. On nights when there is no moon the track is almost terrifyingly dark, but tonight it was quite clear, though the moonlight was pale. Moonlight cascaded like water over the lotus leaves and flowers, and a light blue mist floating up from the pool made them seem washed in milk or caught in a gauzy dream. Though the moon was full, a film of pale clouds in the sky would not allow its rays to shine through brightly; but I felt this was all to the good – though refreshing sleep is indispensable, short naps have a charm all their own. 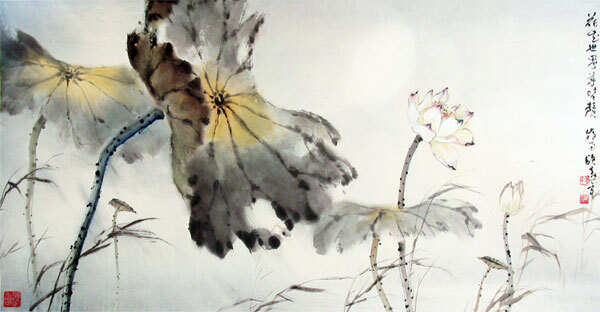 As the moon shone from behind them, the dense trees on the hills threw checkered shadows, dark forms loomed like devils, and the sparse, graceful shadows of willows seemed painted on the lotus leaves. The moonlight on the pool was not uniform, but light and shadow made up a harmonious rhythm like a beautiful tune played on a violin. Far and near, high and low around the pool were trees, most of them willows. These trees had the pool entirely hemmed in, the only small clearings left being those by the path, apparently intended for the moon. All the trees were somber as dense smoke, but among them you could make out the luxuriant willows, while faintly above the tree-tops loomed distant hills – their general outline only. And between the trees appeared one or two street lamps, listless as the eyes of someone drowsy. The liveliest sounds at this hour were the cicadas chirruping on the trees and the frogs croaking in the pool; but this animation was theirs alone, I had no part in it. If any girls were here now to pick the lotus, the flowers would reach above their heads too — ah, rippling shadows alone are not enough! I was feeling quite homesick for the south, when I suddenly looked up to discover I had reached my own door. Pushing it softly open and tiptoeing in, I found all quiet inside, and my wife fast asleep.